During the past few months there have been a tremendous amount of recalls of many different dog treats. After the most recent round of recalls, we decided to read the official report from the FDA. We were shocked to see what was going on with the treats we give our dogs! This got us thinking… why don’t we make treats that are made the right way? With high quality material, limited ingredients, and in a way that makes sense? Well, it took a lot of time and hard work, but we are proud to say that we have done it! Our new line of Jerky Treats includes both a 100% USA sourced and made Chicken Jerky as well as USA sourced and made Bison Liver Jerky. 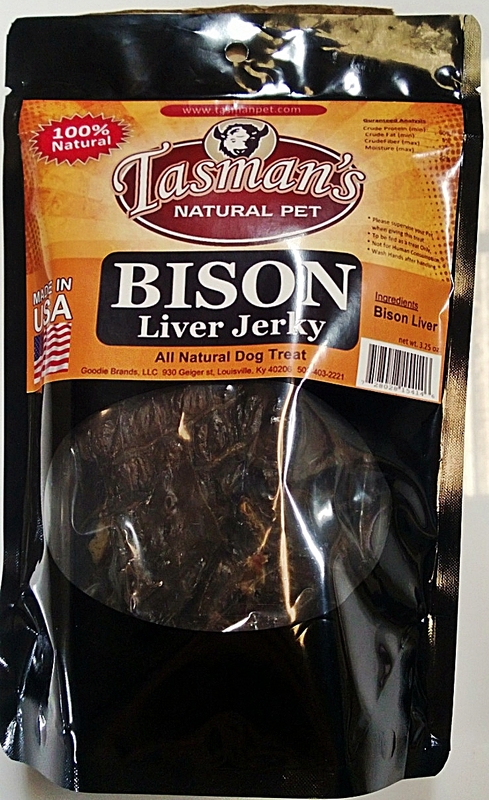 There have been far too many jerky treats that are brittle and dry that can hurt our pets when eaten. Our Jerky is not dried to a crisp like some you may have seen. We make our jerky with a low, slow cooking process that is done in small batches. We offer these treats in 3.25 oz bags because we use NO preservatives and want our jerky to be served fresh. For more information, check out our website, http://www.TasmanPet.com! If you are a vendor or distributor give us a call or shoot us an e-mail to learn how to provide these new treats to your customers! ← Why Bison? Why Elk? I like your website, it has nice articles, Have a great day!